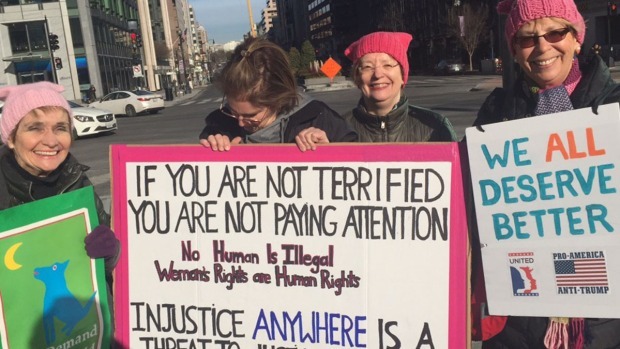 Thousands marched all over the country in support of women’s rights. The women's march in Washington, D.C., had the feel of a political rally as U.S. Sen. Kirsten Gillibrand and U.S. Rep. Nancy Pelosi urged women to run for office and vote to oppose President Donald Trump and the Republicans' agenda. "We march, we run, we vote, we win," Pelosi said to applause. Thousands of people turned out on Saturday for the rally at the Lincoln Memorial and march to Lafayette Park. "The progressive movement is alive and we will fight for our rights and the rights of those in our community," said Emily Patton, a spokeswoman for the march. The "March on the Polls," sponsored by March Forward Virginia, was one of many around the U.S. and the world in support of female empowerment. Thousands of people gathered in Cleveland; Richmond, Virginia; Philadelphia; New York; Austin, Texas; and more. Many marchers oppose Trump's views on issues including abortion, immigration and LGBT rights. Trump on Friday delivered new support to the anti-abortion movement he once opposed, speaking by video to thousands of activists at the annual March for Life. The march urged women to take an active role in elections in 2018. Organizers said the focus this year was to encourage women to persist in building their political power by organizing, voting and running for office. "The past year featured an historic number of women engaging in the political process, including running for office, and it is vital that women and their allies continue to take an active role in 2018 elections," a Facebook page for the event said. “Before last year, I never imagined I'd run for office,” said Del. Kelly Fowler, D-21st District, who was elected in November to represent the Virginia Beach area in the Virginia House of Delegates. She is among a cadre of women inspired to run for office by the first women’s march a year ago. "If Mitch McConnell were a woman, if Paul Ryan were a woman, if our president were a woman, we wouldn't be in the middle of the Trump shutdown right now," said Rep. Don Beyer, D-Va.
Virginia Sen. Tim Kaine also spoke at the rally at the Lincoln Memorial, along with National Organization of Women President Toni Van Pelt and Feminist Majority Foundation President Eleanor Smeal. “I've seen people coming together to say that love is love, that black lives matter, that immigrants make our country great, that science is real," said Denise Gizake of Massachusetts. A march was held in her home state, but she wanted to march in Washington. "This is where our government center is," she said. D.C. police said there was a temporary road closure of 17th Street NW between Constitution Avenue and H Street. Scores of women attended the 2017 march the day after Trump took the oath of office. The march highlighted racial and political rifts, in addition to women’s, reproductive and LGBTQ rights. "I think the first women's march really empowered women to say enough, our voice is going to be heard," Patton said. CORRECTION (Jan. 12, 2018, 4:20 p.m. ET): This story has been updated to clarify that the Washington, D.C. march set for Jan. 20, 2018 is inspired by the 2017 Women's March on Washington but organized by March Forward Virginia.